The communication technology has a great progress in decade, and these changes make our life more comfortable and convenient. In order to invent more powerful products and lower down the cost, the characteristic of coupled-line structure is investigated and used to meet different specifications. Some microwave and millimeter wave circuits are designed with the coupled-line techniques to enhance the performance or reduce the dimensions, such as power divider, balanced mixer, filter, common mode filter, coupler, balun, and so on. The design of artificial coupled-line is one research topic of our laboratory. 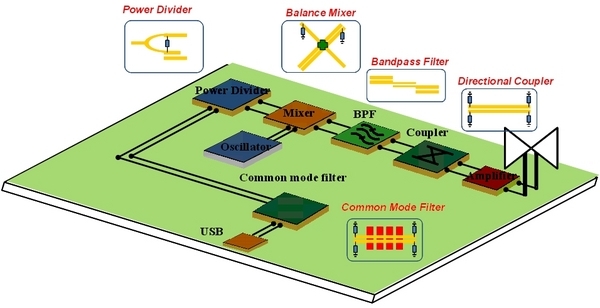 Different from the conventional coupled-line, the artificial coupled-line has some special properties for operating modes, and these particular properties can be applied on the circuits to meet the needs of designers. The design of forward-wave directional coupler with artificial coupled-line is implemented by our group. The periodical artificial coupled-line is applied on the forward coupler design to alleviate the size problem. The higher coupling level and directivity can be achieved compared to the previous works. The size of the coupler is also smaller.